You’ll also get a free subscription to a series of emails that provide more information and support on how to manage your debt. In this 20-page FDR debt relief guide, you’ll learn how to manage debt, evaluate different debt relief options, and find the right solution for you. More importantly, you’ll learn how to assess your current debt situation to see if you are engaged in risky financial behavior that might push you deeper into debt than you want to be. The FDR How to Manage Debt guide also highlights several different strategies for managing debt—including do-it-yourself debt solutions (like the snowball and avalanche methods) as well as credit counseling, debt negotiation (also known as debt resolution and debt settlement), and bankruptcy. For far too many Americans, being in stressful amounts of credit card debt has simply become a day-to-day reality. Credit cards have overtaken cash as the way to pay for things, and it’s easy to see why. Beyond the convenience credit cards offer, many people choose to use them as much as possible to take advantage of points, frequent flyer miles, cash back, or other types of perks. Credit cards enable you to purchase things you don’t have the money for at the moment, but will by the time the bill is due—and if you don’t have all of the money, you’ll have enough to cover the minimum payment. Many people manage their finances this way, by maintaining minimum credit card payments. They assume that because they are not late on bills, they’ll maintain a good credit score, which will enable them to keep borrowing more money. But does this type of debt management actually put them further at risk of getting into debt? The FDR How to Manage Debt guide will explore this question, so you can get a better idea of how well you are managing your current credit card debt and determine if you should begin trying new strategies to reduce what you owe to creditors. You are barely keeping up, and your credit score is suffering. You can’t pay for essentials such as home repairs or medical care. Creditors or collection agencies are calling. If you are experiencing any of these situations, the FDR How to Manage Debt guide was written for you. Its goal is to give you a basic overview of your debt solution options and help you determine what your next step should be. Read it carefully, think about the choices it lays out, and then take action. Keep in mind, there may not be a single solution that works for you. Some people use a combination of debt solutions, while others try a few without success before finding the right solution. What matters is that you take the first step as soon as you can to put your debt behind you. At past points in history, people could go to prison for being in debt. That is no longer the case, but for millions of people who struggle every day with debt, they may feel like they are in a different type of prison—sleepless nights, stress, and even shame. 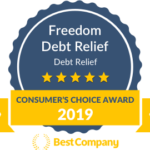 The FDR How to Manage Debt guide was written to help give you freedom from all that, and empower you to take control over your life and your finances. It may feel like the deck is stacked against you, but it is possible to improve your financial situation! Don’t be like one of the millions of Americans who’ve become slaves to their debt burdens. Getting out of debt can be difficult, but the FDR How to Manage Debt guide can be your way of taking that first step toward a new future—where the debt you have today stays in your past.